Two heats from the Mediterranean Horse Union Drivers Championship topped yesterday’s card of the 15th meeting of the season at the Marsa Racetrack. Eight races were in programme with the Mediterranean Championship races run on the rather short distance of 2,140m. In the Mediterranean Championships, the participating drivers were involved in Bronze and Silver Class races. Malta was represented by current champion driver Rodney Gatt who was up against Francesco La Rosa (Italy), Aleksandar Bogdanovic (Serbia), Genadii Bolshakov (Russia) and Michael Izzo (France). In the end it was La Rosa and Gatt who took the honours of the day. In the first heat, open for class Bronze trotters, the early leader, Swedish mare Jezira (Rodney Gatt), ran out of steam when the front horses turned for the final straight. Gatt’s mare was outsmarted by Command Coger (Francesco La Rosa) which registered its first win in Malta by a length from Record Du Mexique (Marvin Cauchi) and Tirana C.N. (Genadii Bolshakov). Veinard Fouteau (Jonathan Farrugia) had to settle for fourth place. The second heat was open for class Silver trotters. Here there was a keen tussle between four trotters in the final straight. It was Gatt who, driving Big Finish, cruised to its second win of the season from Solide Du Jayle (Tony Cauchi) and Ikaros Stursk (Michael Izzo – France). Virtual Paradise (Franceso La Rosa) which led for most of the distance, had to settle for fourth place. At the end of this heat, Malta and Italy were declared the winners of this first stage of the Mediterranean Championship with 9.5 points each. Russia placed second with seven points ahead of France (5) and Serbia (4). Yesterday’s card included also a class Premier race on a long distance of 3,140m. Italian Okay Dei Ronchi (Noel Baldacchino) succeeded in registering its third win in a row easily by eleven lengths from French newcomer The Au Lait (Herman McKay). The two semi-finals of the St Francis Cup Championships, open for class Copper trotters, were also held. From these two races twelve horses made it for the final stage. In the first class Copper semi-final, French Duc D’Haufor (Redent Magro) sealed its second win in a row after dashing from the outside during the last 600 metres and taking the lead in the final straight. Magro’s trotter finished first by a length from Nimbus Bjerregard (Clifferty Calleja), Uranium Des Arkads (Kurt Saliba) and Desir La Douve (Shaun Portelli). Clarito (Alex Cortis) and Yoda T. Dream (Christian Xerri) also made it to the final stage. There was a close finish between Dreamed Victory (Redent Magro) and Freddie Melon (Charlton Gauci) in the second semi-final. It was the former, driven also by Redent Magro, which gained its first win of the season, with Petrus Du Vivier (Julian Farugia), Devil Somolli (Rodney Gatt), Revenge Alone (Andrew Farrugia) and Tasco (Shaun Portelli) followed behind in that order. 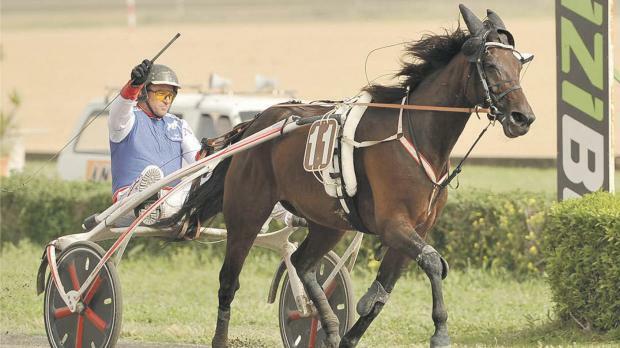 Another meeting at the Marsa Racetrack will be held on Friday. The first race should start at 7pm.